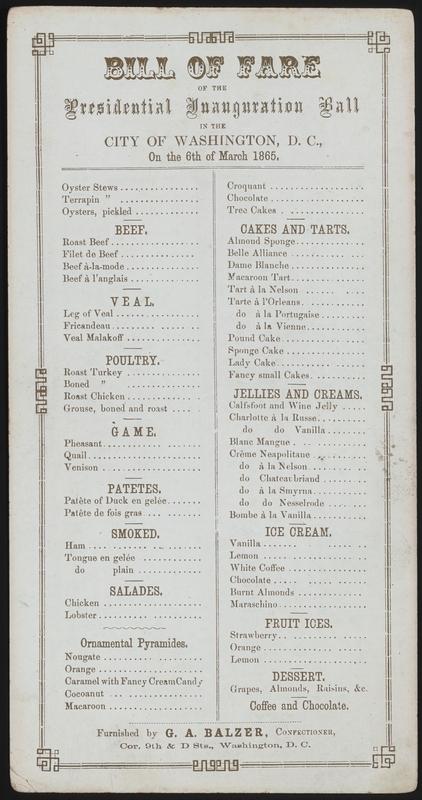 An Inaugural Memory: President Lincoln's Food Fight The Smithsonian recently uncovered the menu from Abraham Lincoln's second inaugural ball, and it provides an interesting look at how different the celebrations were just 148 years ago. Explore NPR's coverage of Barack Obama's second presidential inauguration. 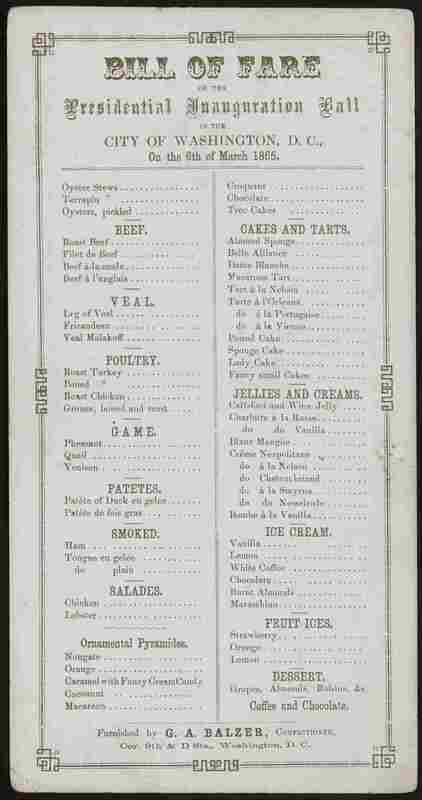 A recently-published menu for Abraham Lincoln's lavish second inaugural ball in 1865 provides an interesting look at how different the nation celebrated its new president just seven score and eight years ago. Smoked tongue en geleé and blancmange (a firm custard) shared room on the buffet table with roast turkey and burnt almond ice cream. As Yale food historian Paul Freedman told Smithsonian Magazine writer Megan Gambino, the cuisine could best be described as "French via England, with some American ingredients." "Oyster stew and pickled oysters. You wouldn't have found them in France as much," Gambino told NPR's Jacki Lyden. Gambino wrote about the menu of Lincoln's second inaugural ball for Smithsonian.com. She also pointed out the presence of turtles on the menu. "Locavores would be excited about seeing terrapin stew on the menu. Actually, I read in an article from The Washington Post from 1880 that any pretentious affair in Washington had to have Maryland-style terrapin stew." The buffet was served at midnight — perhaps too late to keep thousands of hungry revelers waiting. Gambino says, "The buffet table was meant to only serve 300 people at a time, but everyone sort of rushed at once." The resulting meleé resembled a food fight. "Men would go over to the buffet table and they'd fill a tray of food to bring back to their dates and their friends. And they'd maybe hoist it above the rest of the crowd... The food just slopped all over the floor and probably over people." The Washington Evening Star reported at the time: "The floor of the supper room was soon sticky, pasty and oily with wasted confections, mashed cake and debris of foul and meat."